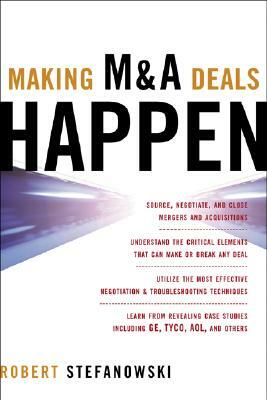 "Making M&A Deals Happen" provides a practical businessperson's approach to making M&A deals that withstand the test of time. The book presents complete guidance on how to source, negotiate, and close mergers, acquisitions, and joint ventures, discussing each stage of the deal process and highlighting the critical elements, risks, and opportunities of each. Bob Stefanowski, who has overseen more than $8.7 billion in M&A deals, equips readers with expert information on the M&A environment... developing a company strategy on M&A...financial modeling and final valuation...bidding strategies...structuring the deal...legal and regulatory issues...and much more. Based on a renowned course the author teaches at UPENN - Wharton "Making M&A Deals Happen" now offers a winning blueprint to all professionals actually involved in the M&A process_ whether in the planning, due diligence, or integration phases.